This result could explain how some of the extremely energetic particles bombarding the Earth, called cosmic rays, are produced. Tycho is a supernova remnant that was first observed in 1572 by a famous Danish astronomer who became its namesake. This image comes from a very deep Chandra observation of the Tycho supernova remnant, produced by the explosion of a white dwarf star in our Galaxy. 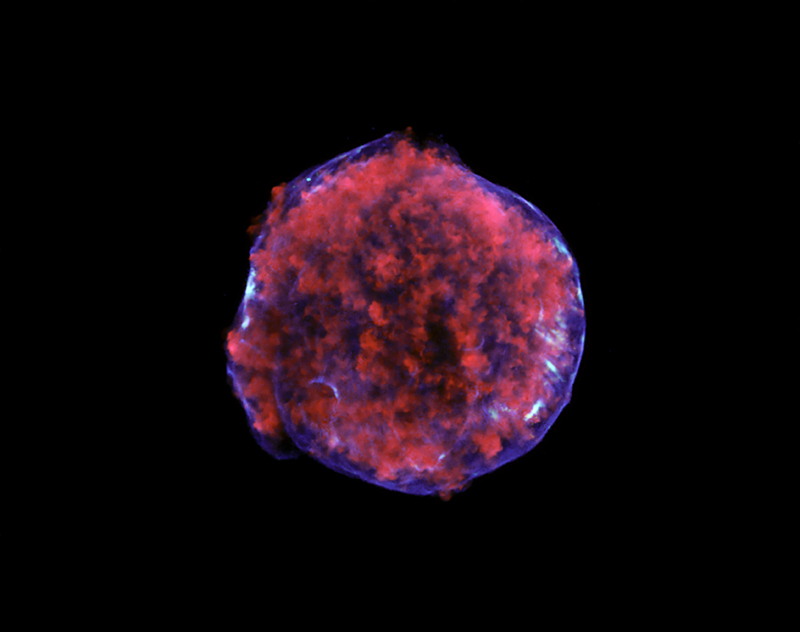 Low-energy X-rays (red) in the image show expanding debris from the supernova explosion and high energy X-rays (blue) show the blast wave, a shell of extremely energetic electrons . These high-energy X-rays show a pattern of X-ray "stripes" never previously seen in a supernova remnant. By rolling the mouse over the color image above, two regions containing stripes in the high energy image can be seen superimposed on the full color version. Some of the brightest stripes can also directly be seen in the full color image, on the right side of the remnant pointing from the outer rim to the interior. The stellar background is from the Digitized Sky Survey and only shows stars outside the remnant. We have also produced an image showing all of the stars. The X-ray stripes are thought to be regions where the turbulence is greater and the magnetic fields more tangled than surrounding areas. Electrons become trapped in these regions and emit X-rays as they spiral around the magnetic field lines. Regions with enhanced turbulence and magnetic fields were expected in supernova remnants, but the motion of the most energetic particles -- mostly protons -- was predicted to leave a messy network of holes and dense walls corresponding to weak and strong regions of magnetic fields, respectively. Therefore, the detection of stripes was a surprise. The size of the holes was expected to correspond to the radius of the spiraling motion of the highest energy protons in the supernova remnant. These energies equal the highest energies of cosmic rays thought to be produced in our Galaxy. The spacing between the stripes corresponds to this size, providing evidence for the existence of these extremely energetic protons. Where can I find more in-depth information on the research of the Tycho stripe formation? If explosions ripped the star, pole to pole. That explains the stripes emanating from near equator to opposed polar areas. Natl Geo July 2004 p. 19 shows solar stripes angled to left and are EM lines whose magnetics attract pos. 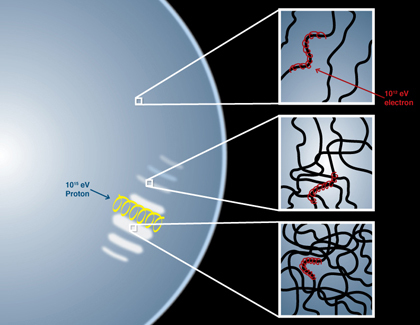 protons out to loop's rise to corona. Protons are stripped by gravity, forming the lower level sluggish return to equator dynamo. With that, spaces between tycho remnant stripes are from asymptotic freedom. One pole of atoms are pos energy. Opposed pole are neg energy. Protons are basic positive energy. Were the X-ray and optical data taken at the same time? Why is there no optical data of the explosion? Do you have any info like these about SNR IC 443? Will you give me exact location, Deg. of that supernova? Seems to be some variation in its location. This post says 7500 ly from us. Thanks for your question. 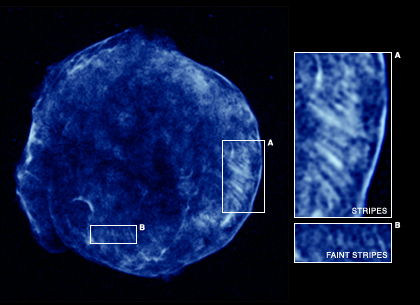 Undoubtedly searches will be made for similar phenomena in other supernova remnants, but deeper images might be needed before other examples will be found. 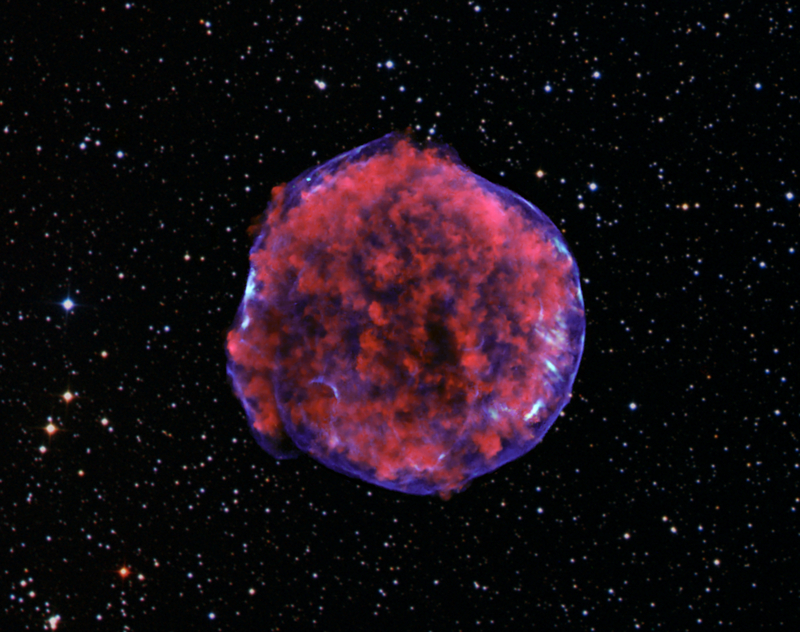 Very few observations of supernova remnants are as deep as the Chandra one of Tycho. Another great first for Chandra. Are you looking into other super nova remnants for the same phenomena? A supernova remnant, produced by the explosion of a white dwarf star in our Galaxy. About 13,000 light years from Earth. About 55 light years across. Low-energy X-rays are red, high energy X-rays are blue, the star field is the optical data. In the constellation Cassiopeia, visible from Northern Hemisphere.